As 2018 comes to a close, we invite you to join us in celebration. What are we celebrating? Why all of you of course! Thank you to our speakers, sponsors, industry partners, volunteers and attendees for supporting our Conscious Cannabiz series this year! Please RSVP by 12/18/18 so that we can give Solidarity a quality head count. 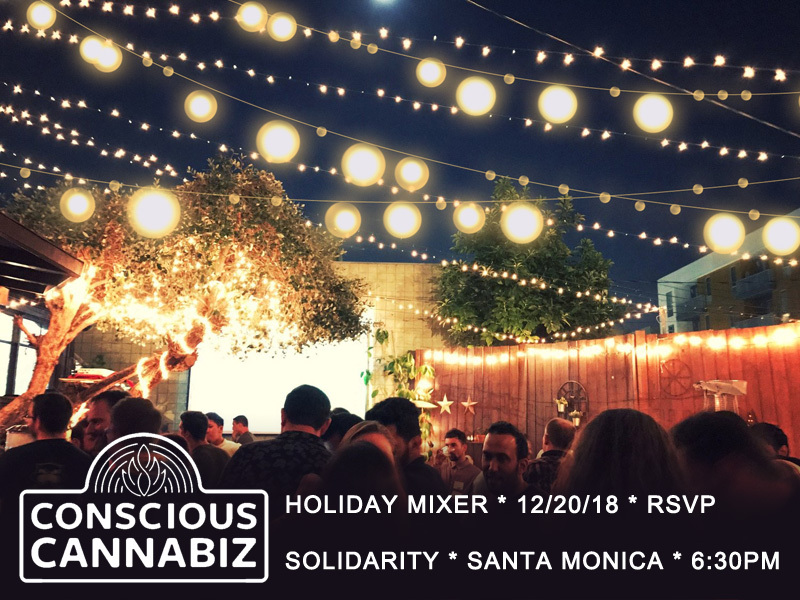 We launched Conscious Cannabiz this year as a monthly cannabis industry event to educate, inform, inspire, and to build community. We’ve covered some serious topics like tribal cannabis and the environmental impact of child-resistant packaging requirements. We brought together some of the greatest minds in this space to create solutions in solidarity. We will continue to bring education and an understanding around the issues that affect the future of our industry in 2019. And more importantly, we will make strides in our mission to build an industry that protects small business while also fostering mindful, conscious enterprise for tomorrow. Keep an eye out for our soon-to-be-launched podcast info series next year!